Lewis Hamilton has raised concerns about Red Bull's decision to swap Max Verstappen and Daniil Kvyat. 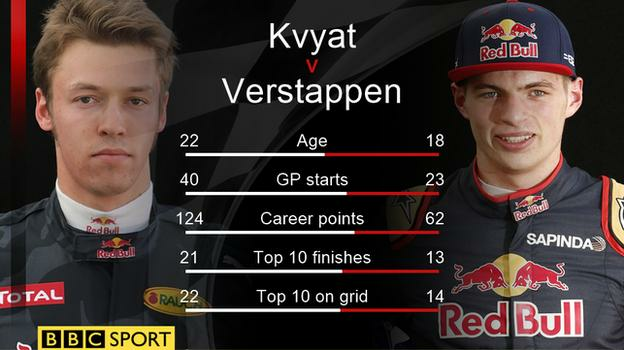 Verstappen, 18, has moved from junior team Toro Rosso to Red Bull, with Russian Kvyat, 22, going the other way. Hamilton said: "Red Bull have done well on bringing young talent forward but they need to be aware that young drivers need time to progress. "Mistakes happen. To take a driver out of a team he is comfortable in and put him in another is a tough decision." 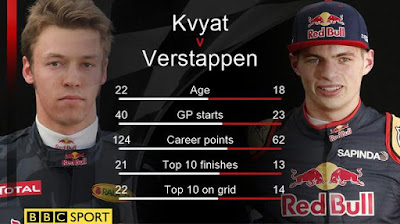 The switch happened after Kvyat crashed into Ferrari's Sebastian Vettel twice in the space of two corners at the start of the last race in Russia - only two weeks after he scored Red Bull's only podium so far this season in China. Hamilton, a three-time world champion who made his debut with McLaren aged 22, added: "A young driver is going to grow in their own time. I crashed on my first day of driving and the first days were really difficult but the team can be a real help in those situations. "They have two fantastic drivers here and I hope it doesn't hinder either drivers' career, because they have bright futures. Too much pressure early on can lead to it going the wrong way." Fernando Alonso, Hamilton's former team-mate and a two-time world champion, added: "The important thing is that both of them race for many years in F1 because they have the potential talent to be world champions." Vettel, who won four world titles with Red Bull from 2010-13, said the decision had "nothing to do with what happened in Sochi" and it had been "decided beforehand". He added that the team should be praised for giving young drivers a shot at F1. "I had my chance and I had a lot of pressure," he said. "If I hadn't delivered I probably wouldn't be here. When you get your chance, you need to use it. "Rather than look for negatives, you should look at the positives, which is that at least people get the chance, and Red Bull are prepared to spend a lot of money on giving young drivers a chance starting from a very young age." 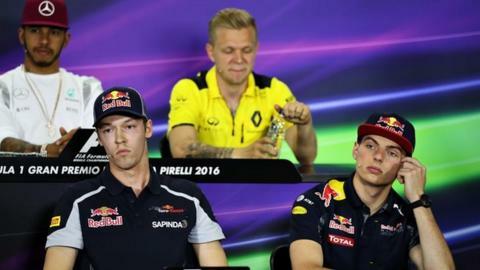 Red Bull team principal Christian Horner admitted the decision was "harsh" on Kvyat, but re-emphasised it had been made as a result of him failing to match team-mate Daniel Ricciardo. And he rejected claims that the team were taking too big a risk by promoting Verstappen so soon. "Certain people said it was too early when he came in at 16 and he has proved to be one of the most exciting things about F1," Horner said. "He has demonstrated he has a great amount of natural talent. He can overtake, he can race. "He has an awful lot to learn, but he has a very mature head on young shoulders and everything I have seen of his development so far has impressed me enormously and that curve will continue." Kvayt said the demotion had been "a bit of a shock" but insisted he would concentrate on trying to do a good job with Toro Rosso, for whom he made his debut in F1 in 2014. He said he had been given "no real explanation" adding that "if the bosses want something to happen, they just make it happen". Red Bull motorsport boss Helmut Marko told the German media that the decision was made because Kvyat was not handling the pressure imposed by team-mate Daniel Ricciardo. But Kvyat said he "didn't see a particular problem with pressure" and "didn't think that was the biggest explanation". He revealed that he was watching television when Marko informed him of the decision. "I was in Moscow," he said. "I was watching a TV series. Dr Marko made the call. It was a 20-minute conversation. I learned many interesting things and then I went back to watch my TV series - Game of Thrones." Verstappen, who started racing in F1 last season, said he was not concerned about the risks inherent in being promoted to a top team so young. "I'm very happy with the chance they have given me," he said. "They are racing for a top team, that was already what I was hoping to do. "It was a bigger risk to be so young in F1 but I have handled it pretty well. "Getting used to a new car is not so easy, but the factory has given me a lot of confidence. It will come race by race and I am going to enjoy it." Hamilton heads into this weekend's Spanish Grand Prix already 43 points behind Mercedes team-mate Nico Rosberg in the championship after engine problems dropped him down the grid in both the last two races. "It is what it is - there is no point being concerned," said Hamilton. "I just have to work hard to come forward. I have less engines (for the rest of the season) and I just have to do what I can with what I have. "For sure I have a mountain to climb but I love a challenge and I am really excited about it."